In November 2005, at the start of of my final year at art college, the class had a group tutorial with a visiting professor. The thing the professor said which I took away from the tutorial was the idea that a finished work remain as close to the original idea as possible. I had seen a lot of art, particularly contemporary painting, which looked over-worked and which I believed would have looked better if the artist had stopped sooner. It’s one reason a work ethic can be so damaging to art. The following morning, 5th November 2005*, I awoke with an idea for an art work completely formed in my mind. I would print paper houses on my computer’s printer, cut them out, fold them and stick them to make models symbolic of the comfort and security of home. At the time I was interested in projected and reflected colour. I decided to print my houses with a block of colour in the roof to act as a filter, projecting colour in to the interior. The original plan was to make perhaps 20 or so houses. I got rather carried away and made over 150 for a work titled “The Wisdom of Bertrand Russell”. The colour projected into the interior of the house is quite subtle and may not be easily noticeable. If two houses of contrasting colours are placed side by side, the colour becomes apparent. 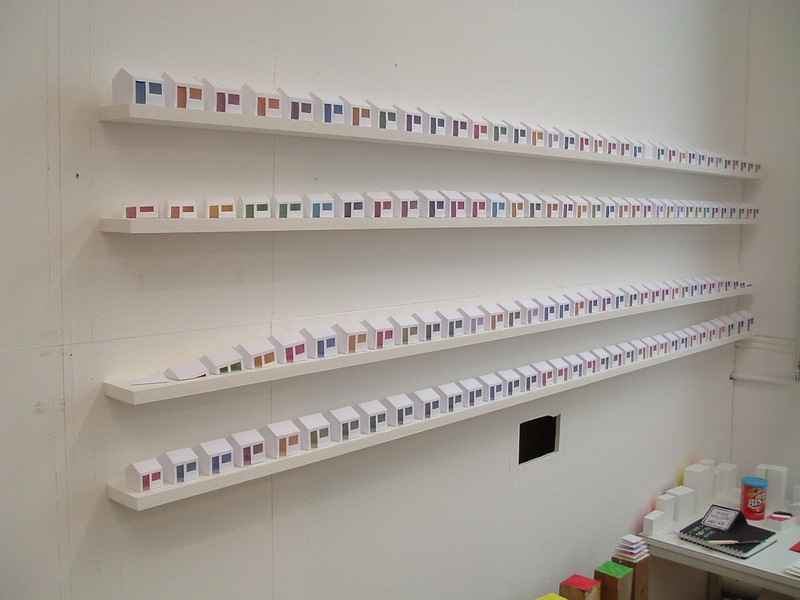 Ten years later I still get e-mail asking where the paper houses have gone and so I’ve decided to put them back. Of all the art projects I worked on, this is the one that got the most interest at the time and still gets the most interest now. At the moment, there are no detailed instructions on how to make these. I hope you can work that out easily enough. If anyone gets stuck, please contact me and I’ll write something down. My top tips are: sharp modelling knife and double sided tape. The double sided tape goes on the outside of the house, the colour is on the inside. I hold the sheet against a window with the printed side facing away from me while I position the tape — the light from outside helps me see through the card to the lines which guide where the tape goes. These files are PDF to be printed on A4 card of or something similar like US Letter. Use white card of around 160gsm which is about twice the weight of typical office copier paper. Make sure you print at 100% and don’t scale. * I remember the date so clearly because it’s my birthday.